During sunny days, it’s tempting to bring food and drinks outside to enjoy the weather. However, it can be a challenge to keep wine (or any beverage) cold in the heat. Wine coolers supposedly keep chilled beverages cold for at least an hour. 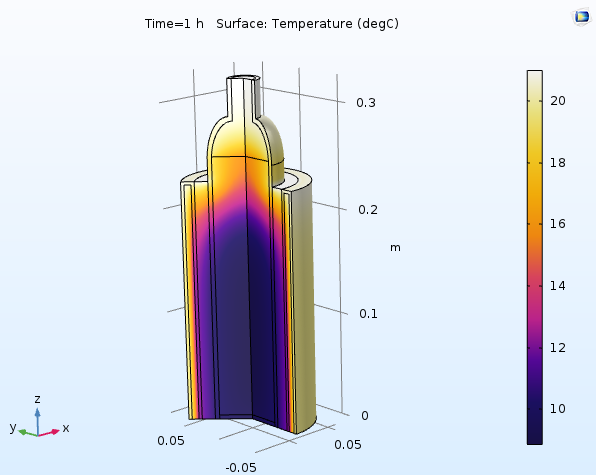 In this blog post, we use the COMSOL Multiphysics® software to see how a wine cooler works and whether or not it can keep drinks cool. How Does a Wine Cooler Work? 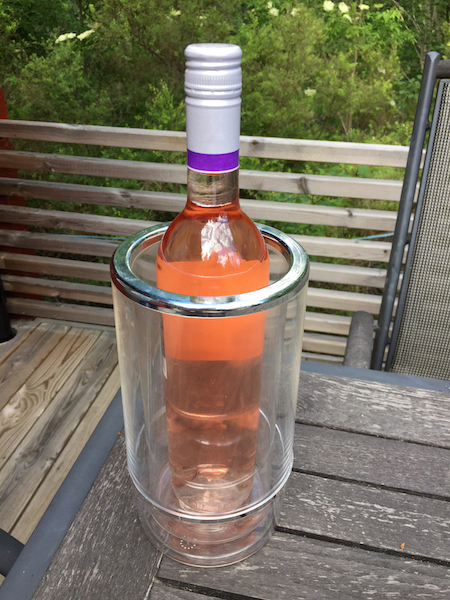 Wine coolers usually consist of an open acrylic cylinder with air-filled double walls. The double walls provide thermal insulation, which prevents warm air from reaching the beverages. A wine cooler on my patio table, keeping the initially chilled bottle cold. First, you place a chilled bottle in the wine cooler. It must be cool, as this then prevents the temperature from rising to a certain extent. The bottle creates a pool of cold air, and because the density of colder air is higher than that of warmer air, the cooler air stays inside the wine cooler. The air in the insulating walls is slightly warmer than the air surrounding the bottle, but cooler than the air surrounding the cooler. The walls prevent the exterior warm air from reaching the inner chamber of the cooler. I performed a quick test at home by measuring the air temperature inside my wine cooler with the chilled bottle inside. The temperature measurements confirmed that the temperature inside the cooler quickly drops from the ambient temperature to a much lower temperature, indicating that this type of simple wine cooler works — at least initially. According to some wine cooler manufacturers, the bottle should stay cold for at least an hour (even up to three hours) without requiring any additional cooling method, such as ice cubes or a refrigeration system. To evaluate if a wine cooler can keep a beverage cold for a certain amount of time, we first need to determine how much the beverage’s temperature can increase before we no longer consider it cold. White wine, for example, has a typical recommended serving temperature that varies between 6 and 12°C (48.2°F and 53.6°F). Since the beverage warms up in the glass when served, I would say that 10°C (50°F) is a suitable limit, above which the beverage is no longer cold. 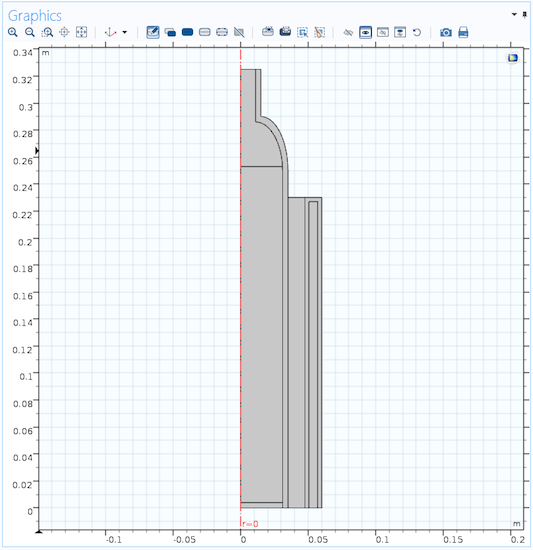 Let’s use COMSOL Multiphysics to show if these manufacturers’ claims are reasonable. In addition, how will the wine cooler perform in outdoor temperatures that exceed normal room temperature? For the COMSOL Multiphysics® model, we can take advantage of the cylindrical shape of the wine cooler and create an axisymmetric model, which is computationally efficient compared to a full 3D model and in line with the desired level of details. We also assume axially symmetric conditions (that is, the model does not account for external effects such as wind or thermal radiation from the sun). The model geometry includes the beverage in the bottle, the bottle itself, the air inside the cooler, the cooler walls, and the insulating pocket of air in between the inner and outer cooler walls. Geometry of the wine cooler model. Heat transfer occurs in all parts of the cooler setup, modeled as heat transfer in solids (heat conduction) in the glass and plastic and heat transfer in fluids (heat conduction and convection) in the beverage and air. To model the more active natural convection around the bottle (because the bottle walls and the cooler walls have different temperatures), the air between the bottle and the cooler is represented using an increased thermal conductivity via a Nusselt number, Nu = 10 (see the settings for the Fluid node below). Similar Nusselt numbers could have been used in all fluids, but this part is where the mixing is the most important. The settings for the Fluid node representing the air inside the cooler, with the setting for the Nusselt number (at the very bottom) representing mixing. For the initial conditions, the bottle and the beverage inside it have a temperature of 6°C, representing a chilled bottle. The air and the cooler have their initial temperature set to 21°C, which is a typical room temperature. For boundary conditions, COMSOL Multiphysics takes care of the axial symmetry automatically when you create a 2D axisymmetric geometry. The bottom of the cooler is considered thermally insulated. For the exterior of the cooler and the bottle, a convective heat flux describes the condition at the boundary, with the external temperature set to the ambient temperature. 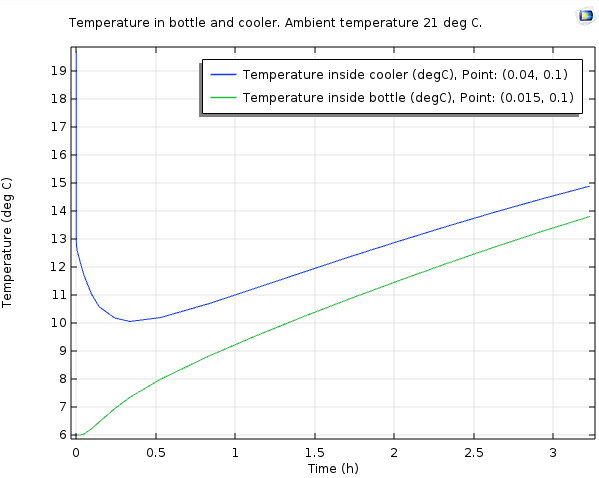 The open boundaries at the top of the bottle and the cooler are represented using a temperature condition: The temperature at those boundaries is set to the ambient temperature. To measure the temperature of the beverage and the air inside the cooler during the simulation, we add two domain point probes that provide the simulated temperature at a point inside the bottle (for the beverage) and a point inside the cooler (for the air). 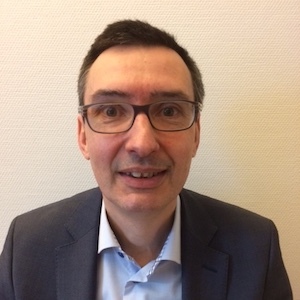 It could also be of interest to use a domain probe to compute the average temperature for the beverage, for example. Initially, the ambient temperature is also set to 21°C (a so-so summer day in moderately warm areas). In a parametric sweep, we will increase the ambient temperature in steps of 5° to 26°C and 31°C, representing a warm and a hot summer day, respectively. The parametric sweep shows us how sensitive the cooler is to the outside temperature. The Settings window for the Parametric Sweep node (top part only). This sweep includes three values for the ambient temperature (in degrees Celsius). Finally, we can remove the cooler from the simulation to check how quickly the bottle would heat up if placed directly in the warm air. 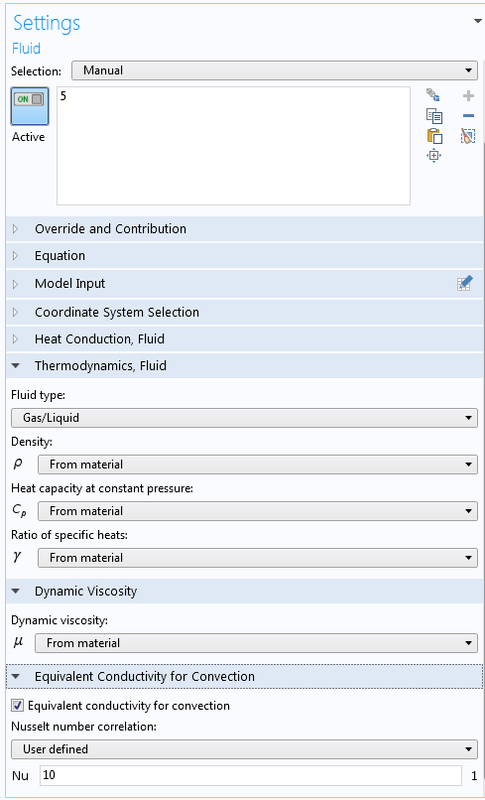 Doing so in COMSOL Multiphysics is easy. We remove the Heat Transfer interface from the cooler domains and assign the same convective heat flux condition as the other exterior boundaries for the part of the bottle’s boundary that was previously an interior boundary, between the bottle and the air inside the cooler. This part now becomes an exterior boundary exposed to the ambient temperature. The temperature after one hour. The bottle and the surrounding air inside the cooler are still cold, except at the top. The temperature inside the bottle (green) and in the air inside the cooler (blue). As the plot shows, the air inside the cooler quickly drops to about 10°C, which matches the measurements I did using a household thermometer. The temperature of the beverage stays below 10°C for almost 1.5 hours and below 12°C for over 2 hours. So, with an ambient temperature of 21°C, the promise of a beverage kept cold for at least an hour seems to be valid. 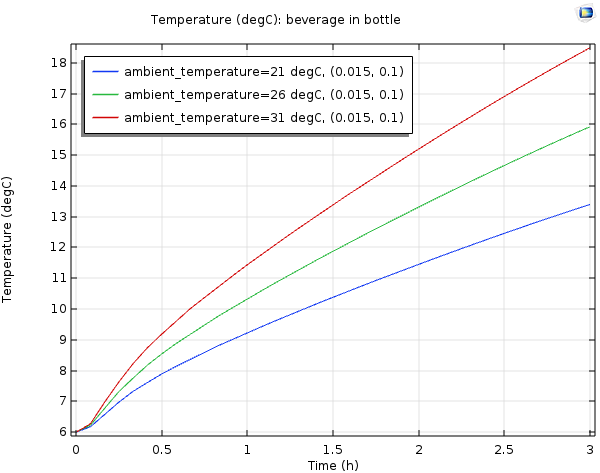 Temperature for the beverage in the bottle, with an ambient temperature of 21 (blue), 26 (green), and 31 (red) degrees Celsius. As expected, when the ambient temperature gets warmer, the cooler cannot keep the beverage cold for as long. For the case of 26°C, the temperature of the beverage is slightly above 10°C after 1 hour. When it’s hot outside (31°C), the temperature of the beverage is warmer than 10°C after 1 hour, but still below 12°C. So the cooler is still doing a good job of keeping the beverage cold, albeit a couple of degrees warmer than the room temperature case. Temperature for the beverage in the bottle without a cooler, with an ambient temperature of 21 (blue), 26 (green), and 31 (red) degrees Celsius. From the plot above, it’s clear that the cooler makes a big difference. Even for the room temperature case, the temperature of the beverage in the bottle does not stay below 12°C. For the higher outdoor temperatures, the temperature of the beverage rises very quickly. Now, we can say for sure that bringing a bottle of wine outside without any kind of cooler is not a good idea. 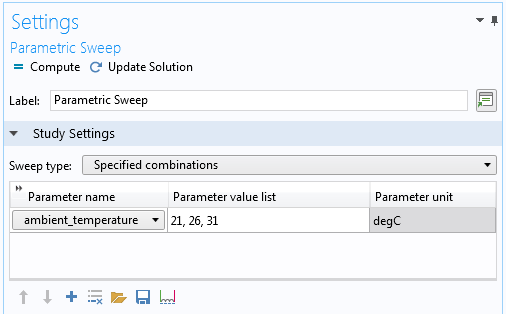 This simulation shows how fast you can set up a model in COMSOL Multiphysics to verify the order of magnitudes (and that they compare to your measurements, if available) and to explore other configurations, such as variations in the ambient temperature, using parametric sweeps. 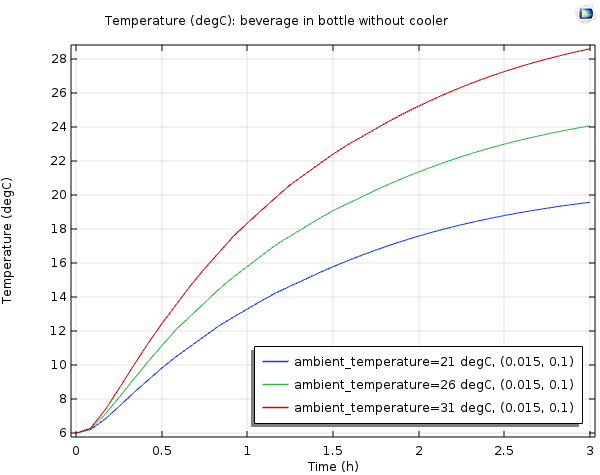 The wine cooler simulation we discussed in this blog post demonstrates that you can, indeed, keep a bottle of your favorite beverage cold for a couple of hours, or at least close to an hour — even if it’s really hot outside. All you need to do is properly chill the bottle before bringing it outside and remember to put it in a wine cooler. Fundamental heat transfer mechanisms then do the work for you, so you can “chill out”.